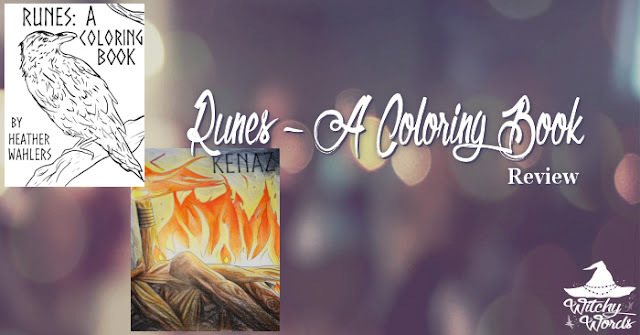 Some months ago, I was contacted by the lovely Heather Wahlers who was diligently working on a runes-themed coloring book, asking if I would be interested in reviewing it upon completion. As a witch with an affinity for the Elder Futhark, I enthusiastically said yes! You can imagine my excitement when I checked my PO box back in August and there it was, shiny and new. As we approach gift-giving season, perhaps this book will entice you to make a purchase for the witch in your life! Heather has repeatedly referred to her Runes coloring book as a "labor of love." A year in the making, she was inspired particularly by the show Vikings, a historical drama from the History channel. While she had used runes before in divination, she never had such a connection with them as she did after indulging in the series. It encouraged her to research their history and lore, thus creating the basis for this coloring book! Music groups like Wardruna and Danheim gave Heather additional inspiration, allowing her to fall into a trance in which the runes could speak with her. She would draw what she felt on paper first, then use a digital tablet to perfect the linework. Each page contains the name of a rune from the Elder Futhark line and a drawing of said rune along with imagery that matches the meaning. These drawings are done in a thin line value to emphasize the colors you choose. Each page ranges from the very simple to the incredibly complex, giving the novice and advanced colorer alike plenty to work with! On the back of each page, you can find a drawing of the rune again along with four or five words dictating its meaning. This allows you to pull the artwork from the coloring book without disturbing another piece and utilize it in your magic, from poppets and altars to flashcards and even ashes! As a coloring book, it certainly succeeds. The paper inside takes colored pencil and marker alike while the imagery is iconic to the meaning behind the rune on each page. If I had one concern, it's that the more complicated pages can get easily lost visually. Added line value could help distinguish different objects and textures better, but it's certainly not a major issue. In fact, it gives the colorer some problems to solve! Overall, I was very pleased with Heather's beautiful coloring book and would highly recommend it for any age! To visit the website of Heather Wahlers, click here. Thanks for this review. I commend your colouring skills! Aw, thank you! I appreciate it. I hope the review helps! I certainly enjoyed it! Thank you, Liz!